San Telmo has been established in a Melbourne city laneway for nearly three years and has had rave reviews for its take on Argentinian cuisine. The latest venue for the Clean Plate Club, regular member Nuts About Town told us the restaurant would have been open even longer had its custom-made parrilla (Argentine charcoal grill) not, literally, missed the boat heading for Australia. The restaurant is built around the parrilla and, as such, meat is a huge part of the offering here – the huge steak knives laid at every place setting are testament to that. We put our hand up for a slightly modified experience though, given Nuts About Town doesn’t eat red meat. Despite that, there was no shortage of tastes, and plates, on offer. On a very chilly winter’s night, San Telmo was a good place to be; the grill makes the room quite toasty and the tables are packed in. While Greedy Girl ordered a pinot noir and FullAsAGoog a pinot grigio, Nuts About Town (a frequent diner) expertly looked after the food. 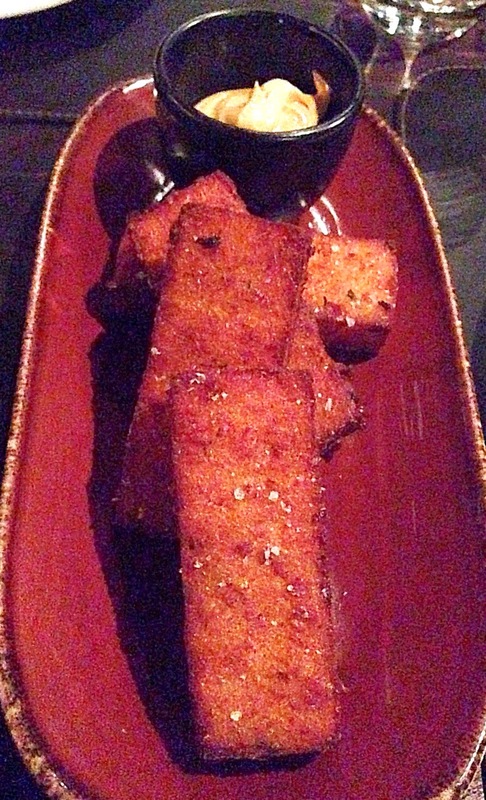 First up was a croquette – one of the evening’s specials (pictured above). Yummy jamon and provolone cheese croquettes sat on a pool of a light mayo. Once again, it’s interesting that the wait staff didn’t offer to ‘up sell’ us to a plate of six croquettes, so we three girls could share evenly. Having said that, the croquettes were on the large side so probably just as well we didn’t order more. The dishes then came thick and fast. 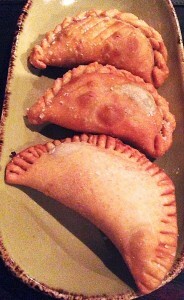 Empanadas were next. San Telmo offers two varieties. Greedy Girl and FullAsAGoog took the red-wine braised beef almond and raisin (at the back of the picture, below) while Nuts About Town had silverbeet, leek and bechamel. Again these were quite large. The beef was soft and the combination very tasty. We then had humita. 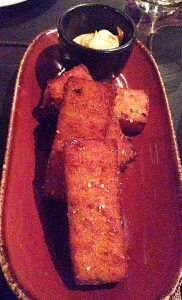 These were polenta, corn and basil chips, served with a chipotle mayonnaise. The texture of these was quite nice; they came to the table piping hot and Greedy Girl couldn’t wait long enough for them to cool so missed out on the flavours developing. She thought, though they could have used a bit more basil for contrast. Still, they went down the hatch. Next, unusually for such a cold night, was a salad. 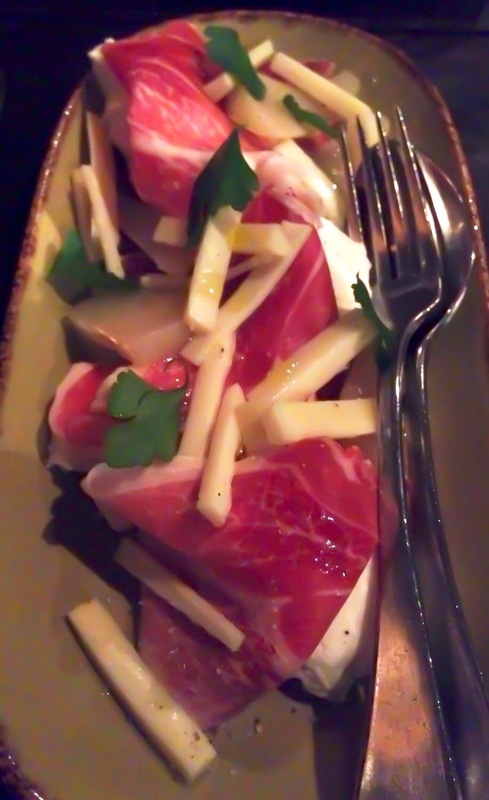 This was palmitos; palm hearts, jamon, preserved pear and buffalo mozzarella. It was a lovely combination. We then had a plate of chorizo. The sausage had been expertly grilled. The meat was soft and the level of spice quite mild. It was a nice dish. 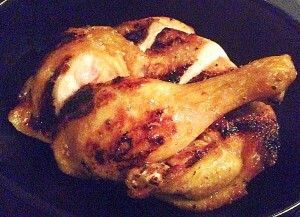 For our ‘main dish’ we took chicken. This was half a roasted free-range, corn-fed chicken, served with minced garlic. It was very moist. For the accompaniments there were potatoes and carrots. 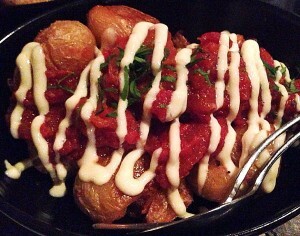 These were duck fat-roasted potatoes with spiced tomato and lemon aioli. Greedy Girl didn’t get any little crispy edges that you’d normally see with roasted potatoes and thought the combination of the two ‘sauces’ was a step too far. Still, they were very edible. The ‘burnt’ carrots were served with the advertised hazelnuts on the side because of Nuts About Town’s allergy, but dressed with thyme and a garlic goats curd. There probably wasn’t enough of the goats curd to go round and Nuts About Town commented when she’d had the dish previously, the carrots were coated more. FullAsAGoog and Greedy Girl spooned the hazelnuts on top but for Greedy Girl they didn’t really taste like they belonged with the dish – perhaps if they’d been warmed and coated with the other elements too, it might have been a different story. It was a power of food, but dessert was still to come. Nuts About Town ordered panqueques. These featured the Argentine classic dessert, dulce de leche. 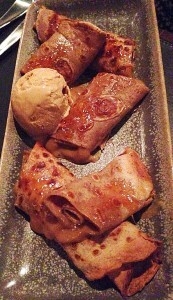 Crepes were spiced with ginger and the caramel and served with a scoop of ice cream. We all tried the dish and while Greedy Girl isn’t a huge fan of dulce de leche (having tried it several times on a trip some years back to Argentina) it was a nice dessert. The ginger gave the crepes a bit of zing. Greedy Girl and FullAsAGoog shared the flourless chocolate cake. This was called Pastel de chocolate and served with poached quince, cocoa nib tuiles and a Drambuie custard. The chocolate was dark and bitter and a lovely foil for the other elements. San Telmo is an interesting venue. Lots of the elements, from the restaurant’s logo to the cow skins decorating the walls were imported from Argentina, as well as the kitchen centrepiece, the parrilla. It’s certainly a meat lover’s paradise but there are a few fish dishes. For a Thursday night straight after work, the place was absolutely jumping and it’s one of those restaurants that does sittings. Our post-work table needed to be vacated by 8.15 and we managed to do that with a few minutes to spare. It was a place to be for a good time, if not a long one. 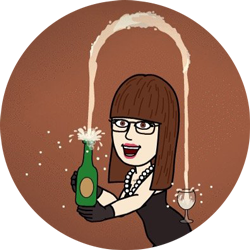 On a cold winter’s night Greedy Girl doesn’t mind dining early and heading home but in the summer, when one wants to linger over dinner and savour a bottle of wine rather than a quick glass, it might be an issue. Sadly the days of being able to sit down for dinner around 7.30pm appear to be numbered.